Troy Henkels passion for exploration has taken him to some of the harshest environments on Earth: the Kalahari Desert in Africa, Greenland, Iceland, the North and South Pole, the Bering Strait, and Mount Everest. Troy grew up on an apple orchard in rural Iowa. After pursuing a career in the corporate world, he quit to seek a more vivid lifestyle in Alaska. Since that time he has been on expeditions all over the world. As a mountaineer, Henkels has been on ten climbing expeditions in the Alaska Range including a successful ascent of North America’s highest peak, Denali 6,193 meters (20,320 ft). Around the world, he has been on climbing expeditions in South America, Iceland, the Himalaya, and various remote peaks in Antarctica. Henkels has competed in several unique Alaskan adventure races including: Iditasport – a 100 mile winter endurance race across the interior of Alaska; Mt. Marathon – a mountain race, which ascends and descends 3000 feet in under an hour; Fireweed 400 Road Race – a 200 mile road bicycle race to Valdez, Alaska; and he’s completed the Mayor’s Marathon in Anchorage, AK. Troy has also been a team competitor in adventure races in Africa, Costa Rica, and Iceland. In 2003, Henkels was a finalist on the adventure TV show “Global Extremes” airing on Outdoor Life Network and ABC. “Global Extremes” took Troy and other participants around the world competing in a variety of adventure races culminating in Troy and four other finalists attempting to climb the North East Ridge of Mount Everest. Troy has spent a total of 17 months in the Antarctic living and working at McMurdo and the South Pole research stations. He was also a key member on the Search and Rescue team at the American Base in McMurdo. For ten years, Henkels focus was on exploring polar environments. In 2003 he made a seven day, 120 km crossing of Iceland’s Myradlsjokull icecap. In 2005, with famed Belgian polar explorer Dixie Dansercoer, he tried to walk from Alaska to Russia across the Bering Strait. 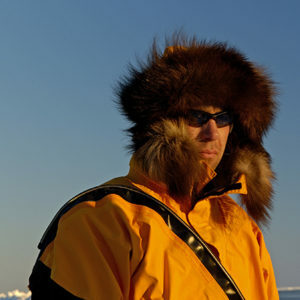 In 2007 Troy was solo cinematographer on the ‘In the Wake of the Belgica expedition, documenting their historical sailing expedition to Antarctica. On this expedition Troy made history by becoming the first person to kite surf in Antarctic waters. In 2009 he guided a five day traverse of the Drangajokull Icecap in Iceland, followed in 2010 by a Last Degree expedition to the North Pole. While standing at the North Pole, Troy became the only person to throw a boomerang around the world……..at both the North and South Poles. Later that year, he became the first person to kite surf on the precarious Bering Strait, while attempting to make the crossing, in summer, to Russia. Troy’s latest focus has been on using kites to cross large Alaskan ice fields. He crossed the Bagley Ice field in 2011, and made a successful crossing of the largest non-polar ice field in North America, the Bagley, in 2013. While not on expedition, Henkels works as a Communication Technician and calls Alaska home. Troy earned his BA degree in Business Management at the University of Northern Iowa. He has traveled and lived in various places across the U.S. and around the world, including Iowa, Missouri, Colorado, Virgin Islands, Alaska, Australia, and Antarctica. He is an avid mountaineer, ice climber, paraglider, journalist, mountain biker, kite surfer, musician, photographer, cinematographer, and most recently published author.